The Foundation for Radiance is a non-profit organization that is dedicated to promoting a healthy, serene and peaceful life for children and adults who have experienced a traumatic event or injury due to hospitalization, surviving a military or war zone, and/or prisoners who need help and assistance in getting back to a peaceful, happy and safe life. 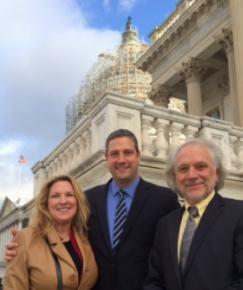 Deirdre and Will tour Capitol Hill with other non-profit leaders to hear Congressman Tim Ryan's vision to create mindfulness in Washington. His book, "A Mindful Nation", a New York Times bestseller, is in the forefront of consciouness to heal our divisions and uplift our potential. Deirdre and members of the Foundation for Radiance attended a black tie event in Miami Beach, Floria to honor Lucia De Garcia, poet laureate of Colombia, with a Lifetime Achievement Award bestowed by the Department of Excellency for the Country of Colombia. Ten outstanding Latino individuals in fields such as academics, philanthropy and the arts were honored. In Lucia's acceptance speech, she dedicated her award to the Foundation for Radiance as she has been a dedicated supporter of the Foundation through her collaboration with the Nuevo Amanecer Mujer Integral. 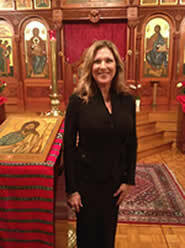 Board Member Dr. Cherie Clark, founder of The Shock Program for prison reform in New York, accompanied Deirdre and other Foundation members to the Women's Prison Association of New York to give workshops on conflict resolution, mindfulness and understanding of how to use one's own inner positive energy to reform. Radiance Pure Energy programs were provided to the women as well as individual coaching sessions. A follow-up program provides women attendees with long term support and guidance. The Foundation for Radiance brings toys, food and clothing to the women and their children every holiday season and provides funds for Thanksgiving and holiday dinners. After attending the workshops provided by the Foundation for Radiance, the women attendees at the WPA responded with remarks such as, "I feel the positive energy flowing in me" and "It's so amazing to see the light in my heart when I thought I only had darkness inside." 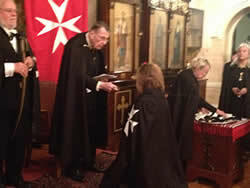 On November 17th, Deirdre was knighted by the Knights Hospitallers of the Sovereign Order of Saint John of Jerusalem Knights of Malta - the Ecumenical Order in New York City. She received this knighting for her humanitarian work as the founder of the Foundation for Radiance. The Knights Hospitallers were the first order of knights, originating during the crusades of the 11th Century in Jerusalem. They were responsible for founding the first hospitals. After the order left Jerusalem they settled in Russia, becoming the official order of the Russian Grand Priories. Her Excellency Countess Nicholas Bobrinskoy, presiding over the ceremony, carries the lineage of the knights which traces its heritage back to Israel before the crusades. A living treasure at 90 years of age, she resides in New York. 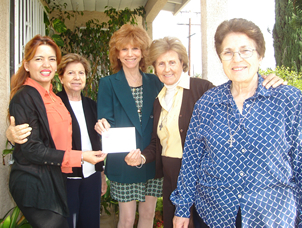 The Foundation for Radiance continues its ongoing support of Sister Trinidad Lopez's program for rehabilitating and revitalizing the Latina women of East Los Angeles. Often faced with a bleak future, most of these women, discarded by society, come with few skills to survive. Sister Trinidad's Nuevo Amencer Integral brings hope, healing and transformation to these women. Through financial contribution and inspirational counseling, the Foundation for Radiance shines a light in the harsh world of abused women. Pictured here is Foundation member Marcie Barkin with Sister Trinidad and members of Nuevo Amenecer Integral. Deirdre is pictured here with Donna Karan, Sarah Brown and Arianna Huffington. Over 300 women gathered to network and collaborate for social and economic change. Giving her signature Radiance meditation, Deirdre closed the weekend event with spiritual teacher Yogi Cameron.